Rather than using a whole-milk Greek yogurt making your own yogurt is a better alternative. It won't taste like a sheep's milk yogurt, of course, but it will be thick and rich flavored, two very important elements in Greek cooking. For this recipe in my village in Greece we used a good, thick sheep's milk yogurt, which is not always easy to find. Rather than using a whole-milk Greek yogurt making your own yogurt is a better alternative. It won't taste like a sheep's milk yogurt, of course, but it will be thick and rich flavored, two very important elements in Greek cooking. Rince in 2-quart saucepan with water. (This will help prevent the milk from sticking to the bottom and side of the pan) Add the milk to the saucepan and stir in the dry milk. Set over medium-low heat and cook just until the milk begins to boil, or until a thermometer inserted in the milk registers about 215°F. Remove from the heat and set aside until the temperature drops to 115°F. Meanwhile, fill a 2 cups, wide-mouth insulated container (such as a thermos) with hot water and set aside. Stir the yogurt into the milk, being careful not to dislodge any of the brown that may have formed of the bottom on the pan. Pour the hot water out of the insulated container. Pour the milk mixture into the container, cover tightly, and set aside in a warm place, undisturbed, just until the yogurt sets, about 8 to 10 hours. Cover tightly and keep refrigerated until ready to use. 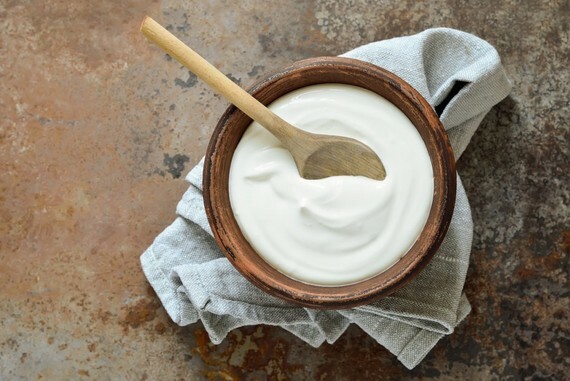 Thickened (or draining) yogurt gives it more body and prevents it from "weeping" when it is combined with other foods. Lay out a 16-inch square of double-thickness cheesecloth on a work surface. Please up to 2 cups of plain, whole milk yogurt in the center of the cheesecloth. Bring up the corners of the cheesecloth and tie them onto the handle of a wooden spoon. Suspend the spoon over a deep bowl, making sure that the bottom of the cheesecloth bag is a couple of inches above the bottom of the bowl. Place in the refrigerator to drain for 8 to 10 hours or overnight. Scrape the drained and thickened yogurt off the cheesecloth into a bowl. Cover and refrigerate for several days until ready to use.